Finely slice red cabbage and white cabbage. Peel and roughly grate carrot. Transfer cut vegetables to a bowl and add olive oil, cider vinegar, and maple syrup. Toss to coat and season with salt and pepper to taste. Set coleslaw aside. Peel and finely slice onion. Rinse jackfruit under cold water. Heat vegetable oil in a frying pan over medium heat and fry sliced onion for approx. 2 – 3 min. Add jackfruit, brown sugar, garlic powder, smoked paprika powder, and cayenne pepper and toss to coat. Season with salt and pepper and fry for approx. 5 min. until the jackfruit is browned. Add barbecue sauce and water, then cover the frying pan with a lid and keep frying for approx. 10 – 15 min. Remove the lid and pull apart the jackfruit using two forks. Keep frying without lid for approx. 2 – 3 min. on medium-high heat until the jackfruit is nicely roasted. Slice iceberg lettuce and set aside. Halve and toast burger buns and spread remaining barbecue sauce on each halved bun. 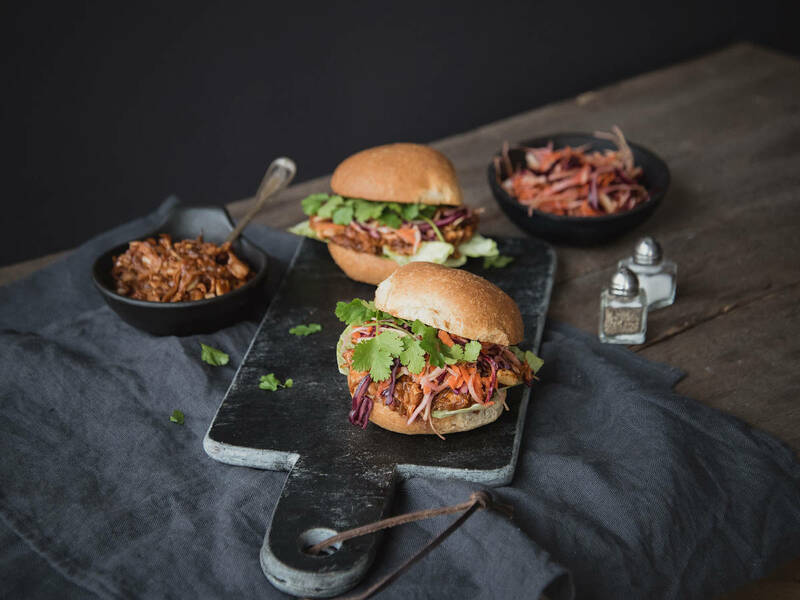 Top buns with iceberg lettuce, pulled jackfruit, coleslaw, and cilantro. Enjoy!